Steve Kinniburgh believes there is “all to play for” as the battle for promotion in the Evo-Stik League South Division One Central. A three-horse race for the sole automatic promotion place has developed with Corby Town sitting in third place, a point behind Bromsgrove Sporting with two games in hand, and five behind leaders Peterborough Sports who sit in pole position. The Steelmen made it six home wins in a row as they beat Bedford Town 4-1 at Steel Park last weekend and Kinniburgh’s team are now unbeaten in their last seven matches. They will be hoping to keep the pressure on the leaders when they head to Barton Rovers this weekend. And, as long as they keep ticking off the results, Kinniburgh believes the next two months will be crucial in deciding who goes up automatically and who will have to try again in the play-offs. 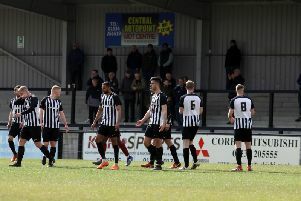 “I think everybody now knows that we are looking at a three-horse race for first place and that is what a lot of people predicted not that long ago,” the Corby boss said. “And, with the way things are panning out, it looks like February and March are going to be really the really important parts of the season. “During those two months, Peterborough Sports play Bromsgrove, we have to play Sports at home and we have got to go to Bromsgrove. “So it’s an important time coming up, those games are going to play a big part in what happens. “It’s all to play for and it is exciting. And I think from Corby’s point of view, it is something that has been much needed after the past few seasons. “It has been an exciting season. We had a good run in the FA Cup and we have been up there fighting at the top end of the league pretty much all the way through. “And I think that excitement is beginning to show itself with over 450 people being at the game against Bedford last weekend. That was an increase for us and 90 to 95 per cent of those at Steel Park were supporting us. “Everything is building nicely and we have an important couple of months coming up. Kinniburgh, meanwhile, confirmed he is hoping to have full-back Miles Smith back in contention for this weekend’s clash following a thigh strain.